What can the Amish teach us? Times are tough for business. You don't have to drive a horse-and-buggy to tap into Amish wisdom. 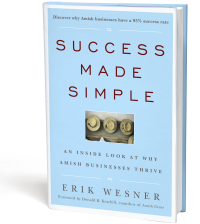 And over 50 more Amish entrepreneurs share wisdom on humble leadership, marketing, management, work and family, “keeping the cobwebs out of the corners”, the true meaning of success, and more. Amish woodworkers form a sizeable segment of the thousands of Amish businesses found across the US and Canada. Specializing in a wide range of furniture, from traditional to contemporary styles, Amish wood craftsmen have developed a strong reputation for quality work. Read more on Amish Furniture, and find an Amish woodworker or Amish furniture retail seller near you. "Captures the soul of Amish business"